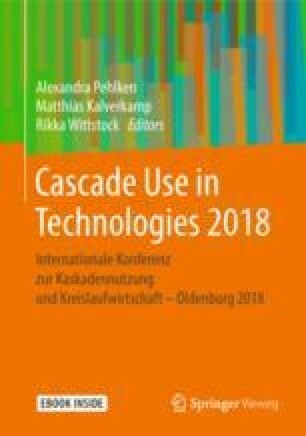 This work quantifies, through material flow analysis, the demand and discard of lead and indium in scenarios of future adoption of perovskite solar cells, considering four aspects for the construction of scenarios. These aspects include the type of perovskite solar cell, the future market share, the lifetime of the modules and the absence or presence, respectively, of recycling. The results show that the demand for lead might not be significant compared to the current supply. However, the use of indium in a high market share scenario might go beyond the current supply of this material. The required amount of material may decrease through the use of tandem technologies, a longer product lifetime and end-of-life recycling. IPCC, “Climate Change 2014: Synthesis Report. Contribution of Working Groups I, II and III to the Fifth Assessment Report of the Intergovernmental Panel on Climate Change,” Climate Change 2014: Synthesis Report. Contribution of Working Groups I, II and III to the Fifth Assessment Report of the Intergovernmental Panel on Climate Change, 2014. [Online]. Available: http://ipcc.ch/pdf/assessment-report/ar5/syr/SYR_AR5_FINAL_full_wcover.pdf. [Accessed: 18-Dec-2017]. N. Jungbluth and M. Stucki, “Life cycle inventories of photovoltaics,” ESU-services Ltd., 2012. [Online]. Available: http://www.esu-services.ch/fileadmin/download/publicLCI/jungbluth-2012-LCI-Photovoltaics.pdf. [Accessed: 12-Jan-2018]. European Commission, “DIRECTIVE 2011/65/EU OF THE EUROPEAN PARLIAMENT AND OF THE COUNCIL of 8 June 2011 - ROHS,” Official Journal of the European Union, 2011. [Online]. Available: http://eurlex.europa.eu/LexUriServ/LexUriServ.do?uri=OJ:L:2011:174:0088:0110:EN:PDF. USGS, “Mineral Commodity Summaries 2018,” 2018. [Online]. Available: https://minerals.usgs.gov/minerals/pubs/mcs/2018/mcs2018.pdf. MBraun, “Slot Dye Coating,” 2018. [Online]. Available: http://mbraun.de/products/coating-equipment/sloit-diecoater/#specifications. [Accessed: 20-Feb-2018]. AZoM, “Indium Tin Oxide ( ITO ) - Properties and Applications,” 2004. [Online]. Available: https://www.azom.com/article.aspx?ArticleID=2349. [Accessed: 23-Jun-2018]. IRENA, “END-OF-LIFE MANAGEMENT /Solar Photovoltaic Panels,” 2016. [Online]. Available: www.irena.org/menu/index.aspx?mnu=Subcat&PriMenuID=36&CatID=141&SubcatID=2734.